TROIKA Bermuda will be presenting their third “Young Choreographers’ Showcase” at 8.00pm on Saturday November 17th at The Earl Cameron Theatre, featuring the work of over a dozen choreographers. 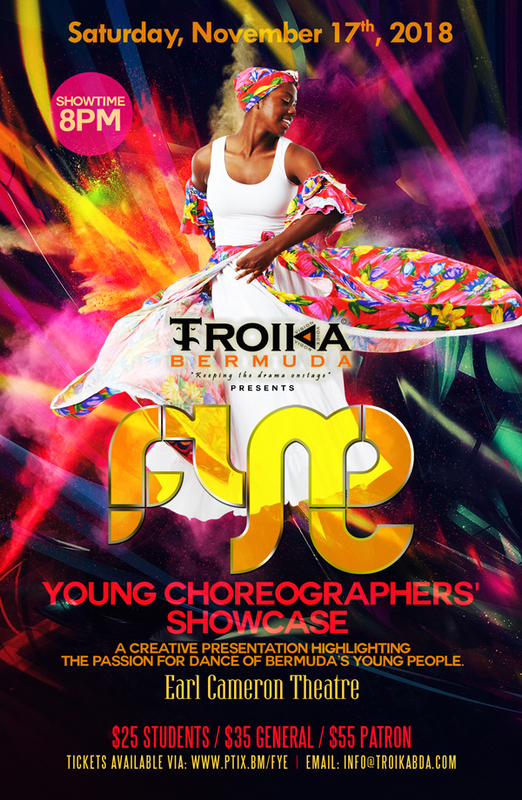 A spokesperson said, “On Saturday November 17th, 2018 at The Earl Cameron Theatre [City Hall], TROIKA Bermuda will be presenting “FYE!” their third Young Choreographers’ Showcase. This showcase will be a creative and explosive presentation highlighting the choreographic talents and passion for dance by Bermuda’s young people. Through this initiative, young performers have been encouraged to strive for their own artistic excellence. “This initiative supports youth participation in all genres of dance. The young choreographers have submitted completed works in dance genres representative of hip hop, ballet, tap, modern, dancehall, African dance, inspirational and Caribbean folk. They have spent time creating, teaching and directing their dance pieces in preparation for the production. The production features dancers from around the island. “The young choreographers include; Denzel Amos, Kioshi Burgess, Kameron Burgess, Sacha Dill, Shanna Henry, Kevonte Jennings — Lathan, J’yindae Preece, India Raynor, Soleil Richardson, Janesha West, Keith Trott, Antione Williams, Mia Williams and guest international choreographer Onika Nduwike. “Tickets are $25 for students, $35 for general admission and $55 for patrons. Seating is assigned; purchase tickets early to avoid disappointment at the door. Tickets can be purchased now via www.ptix.bm/fye.” For more information email info@troikabda.com.